In a relatively short span of time, Social Media Monitoring and Intelligence capabilities have become a useful part of the marketer's toolkit. We evaluate several specialist and larger marketing technology vendors in our Marketing Automation and Social Technology research. Social listening tools offer you the ability to mine vast streams of conversations on social media channels such as Facebook and Twitter, and surface several insights that you can potentially use in customer support, product design, marketing communications, and competitive intelligence. Monitoring tools rely on a mix of statistical methods and natural language processing techniques to try to understand the sentiment of a single post or a tweet and usually classify them into three types: positive, negative, and neutral. At the aggregate level, this could reflect consumer sentiment towards your brand, and many tools assign a numerical score to indicate the strength or intensity of that sentiment. As I note here, you need to exercise caution in any interpretations because of certain inherent software limitations as well the complexity of the human communication process. Social media monitoring, like all other metrics, is best used in conjunction with other analytics, and is often best employed as starting point for further investigation. After several years of enterprise experimentation, we are now starting to see some refinements in these tools. Given that the accuracy of sentiment classification is not going to be 100%, most tools now offer you the ability to override the automatic classification. Of course, it won't be humanly possible to sift through the fire hose, tweet by tweet -- so you have to prioritize. Tools can help you zero-in on the influencers or people who seem to be shaping sentiments (usually by virtue of their large online following). Some tools offer multiple-language support. Some tools are tailored for specific industries and contexts (e.g., sports events) which have their tongues and terms. Many of these refinements are actually efforts to improve the accuracy of the predicted sentiment. Consult our research for a deep-dive of the functionality and vendor comparisons. While the average sentiment score has it's uses, it's a rudimentary rendition of the vast range of human feelings and emotions. Anger, fear, and sadness are lumped under a negative score while emotions such as joy and trust get classified as positive. If you knew the specific emotional state of the consumer, you could perhaps take more sophisticated and accurate approaches. This is what I call the emotionally intelligent social monitoring tool. When you combine psychology research with the bread-and-butter social listening techniques like NLP and statistics, you can get to emotion detection. It's early days but we are starting to see the emergence of such emotion tools. 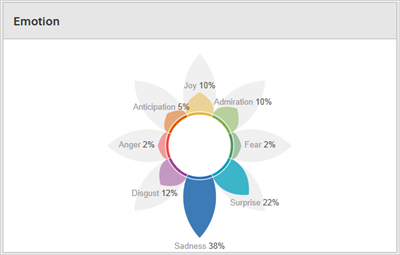 Adobe Social -- in an experimental release -- tries to classify content into eight emotional categories: Joy, Admiration, Fear, Surprise, Sadness, Disgust, Anger, and Anticipation. In addition to the "beta" nature of such tools, there are a few other caveats. For example, when content gets classified into a far greater number of categories (i.e., 8 emotions), each segment will have a smaller amount of data and potentially reduce the accuracy of classification. And even then, some critics contend that important emotions such as "Pride" are missing from the core emotions. Having said that, if you are an early-adopter marketer, you can begin to experiment and figure out differentiating use cases.